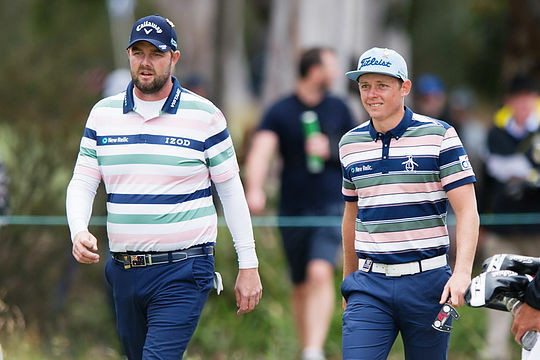 Aussies Marc Leishman and Cameron Smith have made a spirited charge during the third round of the World Cup at Metropolitan Golf Club in Melbourne today. At one stage the pair enjoyed a one shot lead through the opening nine, before Belgium’s Thomas Pieters and Thomas Detry fired a peerless 9-under-63 in the Fourball format to lead the tournament at 19-under-par. Team Australia fired a 7-under-65 to sit at 13-under and in a share of 5th alongside Sweden and England. Leishman and Smith were out of the blocks early but let an opportunity slip on the back nine. They shot 6-under 30 on the front nine – four birdies and an eagle – but had six pars to start the front nine before a birdie on the 16th and some bad luck on the 18th when Smith’s ball hit the flag and rebounded off the green. Smith also remains optimistic the Aussies can make a charge. The Belgian pair have surged to a five-shot lead over Mexico, Italy and Korea, and are six in front of Australia heading into tomorrow’s alternate shot play. Pieters and Detry, who both play on the European Tour, started the day level with South Korea after a steady 71 in rainy conditions in the foursomes (alternate shot) format of Friday. The pair combined brilliantly today and will be the team to beat come Sunday.